UPDATE: The latest versions of WordPress (as of 12 July 2009) all have upgrading options in the administration panel. So you only need to backup your database, click that upgrade link/button in the admin panel, and that’s it. 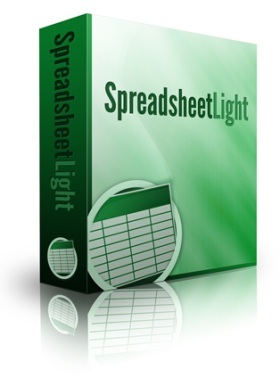 Just go get the latest version, and save yourself the hassle. So WordPress version 2.3 was released on 24th September 2007. The question is, do you upgrade? I’m just getting comfortable with WordPress, and then they announce a major upgrade release. As I see it, there are 4 types of people: bleeding-edgers, early adopters, late adopters and the non-budgers. I usually hover between the first two groups. In the case of WordPress, my procrastination could be summed up in one word: laziness. This one’s easy. 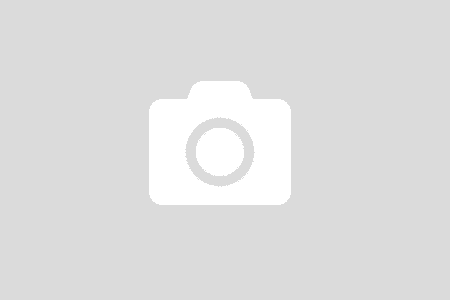 The backup instructions provided by WordPress are easy to follow, and there are pictures. Can’t see how anyone can fumble on this. WordPress suggests that I backup all the WordPress files. I thought that since I’m backing up stuff, I might as well go the whole nine yards and backup everything. So I downloaded my entire site onto my computer. I also did an export of the posts from within the WordPress panel into the .xml file. Just in case. Starting to veer away from the instructions given by WordPress. My reasoning is that I want the upgrade process to happen so fast that even Superman won’t notice any site downtime. So I want everything that can be done without involving the site to be done. This include any downloading of plugin updates. 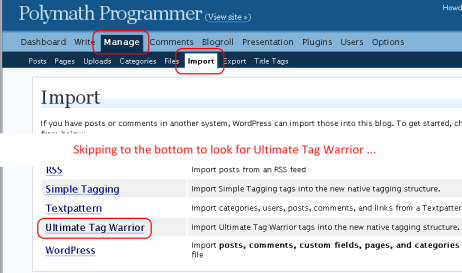 I was able to find updates for all the plugins except Ultimate Tag Warrior, SEO Title Tag and Subscribe to Comments. Well, version 2.3 has in-built tagging capabilities, and I found UTW to be a bit intimidating when I set it up. I don’t need that much flexibility anyway, so UTW is dropped out. It was one of the major reasons why I wanted to upgrade in the first place, for the native tagging capability. As of this writing, Netconcepts announced a working version of SEO Title Tag for WordPress 2.3 by 31 October. Well, I’m already in the mood for upgrading, so I’ll upgrade later. From what I found, there’s only minimal incompatibilities. Official word from WordPress compatibility results shows that “Primary function is fine but returns a fatal error when tag pages are accessed.” Hmm… oh whatever, so I just went ahead and installed what Netconcepts had first. As for Subscribe to Comments… no news from Mark, and I made a decision and dropped the plugin. It hasn’t been of frequent use, so it’s not too bad. So I downloaded the package first, and extracted everything. I didn’t follow the WordPress instructions as given. But the idea was to make sure database backup was done (and usable), file backup was done (and usable) and plugins deactivated. Checked. Basically, you fire up your favourite browser, and type http://example.com/wp-admin/upgrade.php into the address bar (assuming example.com is your site). Or http://example.com/blog/wp-admin/upgrade.php if you installed on a subdirectory “blog” when you first installed WordPress. This was the point where I realised I couldn’t upgrade because I was missing the wp-config.php file, which I was supposed to leave alone. Luckily, I made a full backup. See how useful that was? Whew… I uploaded the wp-config.php from my backup, and ran the upgrade program again. It worked like a charm! Nothing to do really. But I clicked the update button anyway. I uploaded all the updated plugin .php files, and reactivated them. Except for Ultimate Tag Warrior. I went through all the plugins and saved the settings. Particularly the Google Sitemap Generator, since I’ve got to rebuild the sitemap. Failed. Because I was using an Ultimate Tag Warrior function for displaying tags. Ok, deleting from my .php files. Site restored, sans tags. This turned out to be easier than I thought. Look at Technical Itch and Rich’s two part article for more information. 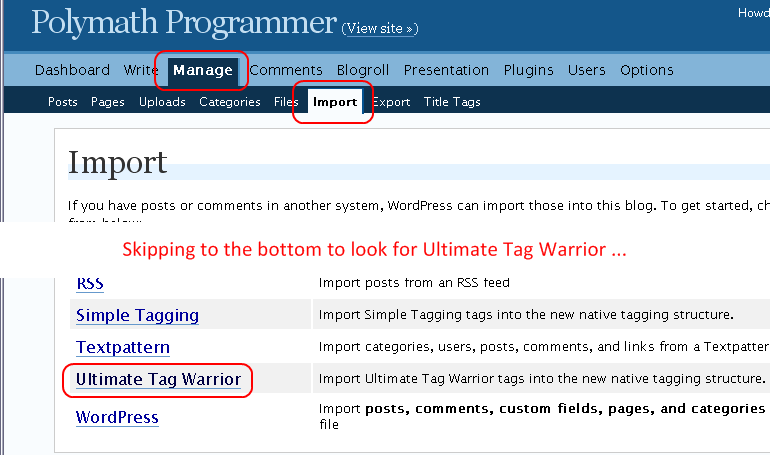 Simply go to the WordPress control panel, select [Manage], then [Import], then scroll down to find the Ultimate Tag Warrior link. This gives you some flexibility with CSS for a more customised display. Anyway, that chunk of php code was added into my index.php and single.php, just after the post content. Uploaded the two files and rechecked blog. Yay! We’ve got tags! One small note: The imported tags have a dash in between words. So if the original UTW tag is “original tag”, it’s displayed as “original-tag”. The original UTW tags are stored with a dash anyway (you should have noticed it when you save your drafts with tags). It’s not a big deal. Perhaps when I’m in the mood, I might go into the database and flex my SQL powers to do update statements. Right now, I’m just glad everything went smoothly. This one’s not in the official upgrade guide. What good is an upgrade if you can’t use it, right? So I went ahead to write up a new post. You’re reading it! I came across a problem I’ve never come across before. I can’t save my post. What!? After all that hard work, I can’t save a post? Then I checked my post length, which isn’t much longer than usual. I deleted some text and tried. It went through. 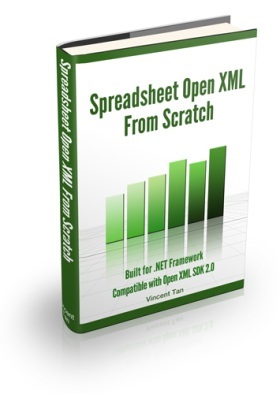 to your .htaccess file (located at the root of your blog). Problem solved. I have successfully upgraded my blog from WordPress 2.2 to 2.3. The entire process took about 3 hours, with the better part of it used on downloading and uploading stuff. Actual manual interaction was much less. I drank tea and dozed lightly in front of the computer most of the time, keeping tabs on the whole process. Tell me about your experience with upgrading in your comments! Glad your update went smoothly. I too like to take full backups of my entire site onto my local computer. I like to make sure I have as much backed up should things go wrong. Thanks for linking to my site too. Disk space is quite affordable nowadays, so backups should be a must. I was actually wondering if I had to do some digging into WordPress documentation and see if I could transfer UTW tags into native format. I’m so glad I found your article. Hi AW, I’m glad for #14 too. Thanks for visiting!